I’ve been wondering for a while now what the ‘next big thing’ is in terms of internet marketing and product creation, and how us bloggers / entrepreneurs can get in early. 7 years ago, it was smartphones. Big app developers became millionaires overnight as the mobile app market grew into a 10 billion dollar a year industry. A few years ago, Kindle and other eBook platforms took off and are still growing rapidly today. What’s next? I think e-Learning is going to be the next big thing, specifically with video courses. Why do I say this? Let’s think about why people spend money. They spend money to solve some sort of problem. When it comes to video courses, that problem is the need of knowledge and the lack of education. Traditionally, knowledge will be gained from a college or university, which today costs tens or even hundreds of thousands of dollars. Honestly, I think we’re in a post-secondary education or student loan bubble that is going to burst. College tuition prices are going up while the value of a college degree is going down, and you’ve really got to wonder how long this trend is going to continue. The truth is, many of the degrees people are graduating with have no value whatsoever, and are certainly not worth the – in some cases – hundred thousand dollars it cost the student to acquire it. No, eventually this trend is going to stop. It has to. 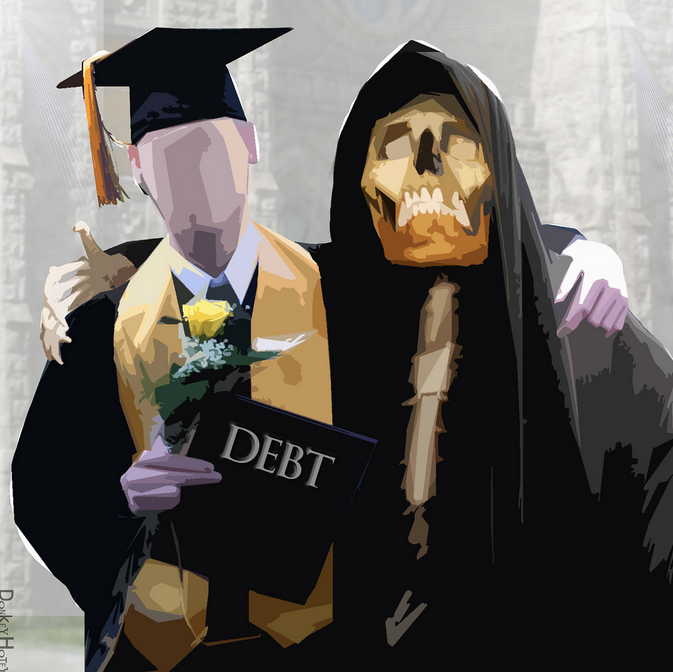 People will eventually realize that it is simply no longer worth it to go to college for many fields, because you’ll end up working the same minimum wage job, except now you’ll have debt. From a financial standpoint, that just doesn’t make any sense. So what happens next? Honestly, I think this is going to depend on the employer. I think that as degrees become so abundant that they lose their value, many employers will start turning looking towards other factors that will determine the potential employee’s capabilities to do the job. Really, employers do not care what degrees you have. They value degrees because they are an indicator that you’re able to do the job. Well, if everybody has a degree, that becomes less important. In the end, the employer wants to hire whoever does the job best, because that’s the person that will make them the most money. That’s all they care about. Now let me tell you, half of college is worthless. Half of the classes you take have nothing to do with your major, and the knowledge you gain will not help you at all with your job. So here’s what I’m thinking – if employers place more of a value on capabilities and less on a degree, than there will be no need to take all of those extra worthless classes. You just need to learn the things that are relevant to your career field. This is where e-Learning and online courses come into play. As you may know, we have platforms like Udemy that host thousands of different courses for thousands of different subjects, taught by experts like you and me. Bear in mind these are people who actually have experience in the subject they are teaching about, so you know you’re going to be hearing actual facts that actually work. I still find it funny that people go to college for a degree in entrepreneurship, where they learn from professors who, get this, have never actually started or ran a business in their entire life. Heck, they’ve never even worked for a business – they work in the public sector! With these online courses, you can get a higher quality education on a subject from the comfort of your own home, for a heck of a lot cheaper than the price of a college course. Now obviously this isn’t going to replace education that requires hands on learning like chemical engineering or neurosurgery, but for those classes where you’re really just reading through a book, this could be the future. Seriously now, I’ll give you an example. One of the last courses I took at college was on retail management. The textbook that I had to purchase was $250. The class I took was online and cost about $1000 in tuition. That puts the total cost for the class up to $1,250. Read chapters 1 and 2 in the book. Take this multiple choice, computer-graded test. Two weeks later: Read chapters 3 and 4 in the book. Take this multiple choice, computer-graded test. Rinse and repeat until the quarter ended. I do not think I heard a single word from the instructor all quarter. $1250 for all of that. 83 different lectures, 11 hours of video. Price for the course? 99 dollars. 99 freaking dollars. My college course that was basically nothing more than “read this book and answer these questions” was 12.5x more expensive and offered less value than this $99 course. Heck, for the price of my one college course, I could probably gain an entire MBA’s worth of knowledge using online courses. It’s been extremely clear that online learning is on the rise. It makes sense. Online education is not only cheaper, but it’s more convenient as well. People seem to be busier than ever (probably from all the debt they’re carrying) and want to be able to choose when they get to do things. That is why online colleges are becoming more popular, and why I took online courses when I was in college myself. It’s not just online college education that is increasing though. Sites like Udemy and Khan’s Academy are becoming more and more popular every month. We’ll just use Udemy as an example because that’s what we’ve been talking about the most so far. Udemy announced at the end of 2014 that it now has over 5 million students, which is an increase of over 213% from the previous year. They’ve also announced that students have enrolled in 13.4 million courses, a little under an average of 3 per student. Revenue grew 160%, and the rate at which courses are being released is increasing exponentially. And that’s just with one site. The real question is whether or not this trend is going to continue, and again as the college / student loan bubble pops, I think it has got to. This means that it’s time for entrepreneurs like you and me to enter the market before it gets flooded. 4 course sales within 6 hours of the course going live! One of the reasons I decided to write this post was because my first course went live on Udemy today. A slightly less awesome version of my Blogging For Money: Starting Your Very Own Web Business course just went live on Udemy about six hours ago. 4 Students have already signed up, with no effort on my part! It’s definitely too early to draw any serious conclusions, but I have been told that one in 4 instructors is currently making more than $10,000 a year on Udemy. That is no small chunk of change, considering a full-time minimum wage income isn’t much higher. We have an advantage over many Udemy instructors because we are bloggers and marketers. We have our own sites and our own followers. This means we have a method of driving traffic to Udemy and making more sales, pushing our courses further up their organic search results. Here’s the thing though – Udemy is very greedy with their commission. You earn 50% of the sale price if somebody buys through their organic search. Sometimes this isn’t even half of your retail price, as Udemy supplies coupons to their users all the time. One of the sales pictured above only granted me a $5 commission, as somebody grabbed the course with a $10 coupon. Still, that is a $5 I never would have had if I hadn’t published on Udemy. Not to mention, that student may end up becoming a loyal visitor of the site, subscribing to my email newsletter and purchasing future products from me. Who knows? Of course, $5 is not spectacular at all for a $97 course, and I certainly wouldn’t bother to market my own product for that little. Hence why I host a better, upgraded version of the course on my own site where I keep 100% of the sales price after transaction fees. Honestly, I believe anybody who already has a following or a way to market their course should publish a version both on their own website, as well as on Udemy. Your own marketing efforts should go to promoting the version on your site where you make more per sale, and let Udemy do their thing and earn you a bit of passive income on the side. You get the best of both worlds that way – the benefit of Udemy’s search platform, and the full profit from your own marketing efforts. I pay a 50% commission to all affiliates who sell my course on this site, so I like to think of Udemy as a giant affiliate as I earn roughly the same amount through their sales as I would if one of my affiliates sold the course. As A Blogger, Should You Create A Video Course? Every blogger needs something to sell. I actually talk a bit about this in my course. Not only do you earn more per sale, but your visitors are more likely to buy a product YOU create rather than one somebody else has created because they know and trust you already. The question is, should that product be a course? The eBook market is already a bit saturated, but that’s not an issue if you’re marketing the book yourself. There are certainly less competitors with online courses, but there also aren’t as many people purchasing them. However, the thing that makes courses great is the amount in which you can sell them for. I sell my book, The Young Entrepreneur’s Guide To Business, Finance, and Life for $9.99. I sell my course for $97. I’m not sure why, but people are willing to pay way more money for video courses than books. Best of all, the course actually took less time to create! I can’t speak from experience because I’m definitely not an expert on course creation, but I think there is a reason why so many of the big marketers are selling courses rather than books. They provide a greater return on time invested. The increased price also makes promoting the course a more attractive option for potential affiliates. All in all, it seems like there’s more money to be made with the same amount of effort. Will this hold true for you and me? Only time will tell! What do you think the future of e-Learning looks like, both for students, and for us as marketers? Have you created a course? If not, what’s holding you back? Udemy vs. Self-Hosting – What’s Best For Your Online Course? What To Expect From Me This Year – Courses, A Podcast, And More! You are brilliant! I was not familiar with Udemy but I will sure look into it. Marketing online is something that people have a need for. But…marketing the right way! I took a look at your course and it is fantastic. Everything one needs to know to get up and going. I do believe in this economic climate we are in, things will be going from bad to worse. It makes sense to get an online course, put it into action and start making money. Sure beats the heck out of spending so much money for a college education, unless one wants to learn specific things like engineering, becoming a doctor etc. But for the average Joe, going to college to learn Entrepreneurship? What a joke! I had to laugh when I seen that one lol. Udemy is awesome. My experience with them so far has been awesome. I managed to bring 15 new students in the first day with no marketing whatsoever. While I’d much rather those people be paying customers on my own site where I make more per sale, that is still 15 sales I would have never made if I did not put my course on their platform. I think heading forward specialized education is going to be more important to employers. What I’m hoping is that doesn’t mean people have to pay to get their master’s degree over a bachelor’s. I’m hoping specialized courses will be sufficient enough to teach employees everything they need to know. I’m reading a book at the moment called “Think And Grow Rich” by Napoleon Hill. A timeless book that I’m sure you’ve heard of. Well, one of the lessons it teaches is that specialized knowledge is more important than general knowledge, which is what a lot of college/university courses teach. He asks why people waste time filling their heads with unpractical general knowledge when they could spend that time and/or money specializing in something. If you are able to access general knowledge when you need it, than don’t waste your time learning it. It really makes a lot of sense. As an entrepreneur, I want to learn how to make money. Therefore, I spend my time educating myself about making money, selling, and business. If I want to learn the history of the United States, I’ll look it up on Google or something if I actually ever need to do that. Why clutter my head with knowledge that doesn’t help me achieve my goals right? If you have any questions about Udemy or there’s anything I can help you with let me know! James McAllister recently posted…Blogging For Money: Starting Your Very Own Web Business! I’ve heard of Udemy but I never dove into it. But I do have to say that you’re right. Why would anyone want to pay for a $1200 course for a semester at a unversity where they can take the same course which is has more quality for under $100? It seems more logical to do this, but I think a lot of people are still focused on getting a title from a prestigious 4 year university. Right now it’s all about image. But from my experience a degree is great for getting a job interview, but not necessarily the job itself. It’s more about who you know and how you can be an asset to the company. As far as elearning, I do believe it holds a great future. You even added the stat that it grew 213% within a year. That really tells you something! Thanks for sharing James! Have a great rest of the week! Yeah, I completely agree that the main factor behind the education is the piece of paper that says you did it all. The real change is going to come with the employers. Like I said, they want to hire the person that will do the job right and make them the most money. A degree doesn’t hold the same weight they used to, and I think more and more people are starting to realize this. The sad thing is that even with that degree, the money made from the job often is not enough to merit the cost of obtaining it. This is becoming more true every day. Of course there are exceptions but the sheer abundancy of degrees are lowering their value. e-Learning is definitely on the rise, at this point we can only speculate how much further it will continue to grow. One thing’s for certain – if there are people spending money, I want in on it. So far, the sales I’ve made on the platform have not let me down! Good to see you again Sherman and I’ll be over on your site here pretty soon! James McAllister recently posted…What Does The Future Of Internet Marketing Look Like? Jame, that is nice idea about product create. I heard about your eBook on Donna’s blog. You know..? It was really awesome reviewing about young entrepreneur like you. Actually, now I am currently write my first ebook. I have finished my first chapter with over 5000 words plus. I don’t how mess is my first eBook, but I have to follow what you did. Thanks for sharing about coming up idea, actually I really planned about e-course training. I heard about Udemy, and I have affiliate account over there. But I’m not ready to make money yet. Hi Kimsea! Sorry I missed your comment, I thought I had already responded to it but I guess it never went through. I’m very glad to hear that you’re writing your own book! That’s awesome! Sounds like you’ve made a lot of progress too – 5000 words is a great start. The first book is always the hardest, once you’ve written one the second one is a lot easier. I’ve slowed down my book writing a bit now to focus more on course publishing. I think e-Learning platforms have a lot of room to grow and there aren’t many instructors there yet, so I’m jumping in now. It’s not quite as passive as Kindle publishing, but Udemy is a nice revenue stream that is worth pursuing in my eyes. Let me know how your book goes! Well, it’s okay…, I’m really glad to talk about this to you. Well, my first eBook writing is really mess, and it was a bit delay..
You mentioned the way they had you study for a course that cost $1,250 dollars. That seems like the one that should priced somewhere between $67-$97 dollars for the semester!LOL! Although, since you brought up such an extremely valid and highly relevant point, with regards to the overall pricing of courses. Especially at the four year major university level. I’d really love to see some really in depth analysis, breaking down and itemizing some of those costs! Like “what” percentage actually goes to the tenured Professors and their really cushy pensions and base salaries and other perks etc!LOL! Because without a doubt, it’s those bloated salaries and other administrative costs and perks, that are constantly driving the cost of college education up and up! A break down itemize look at how and what percentage of each dollar actually goes to, would be extremely revealing, to say the least!LOL! I definitely agree with you, that this trend of e-learning will only continue upwards! Great post and thanks for sharing it! Mark recently posted…So Entrepreneur What’s The Real Reason You Still Haven’t Built Your Very Own WordPress Blog Yet? Hey Mark! Good to see you again and sorry I missed your comment, everything’s a bit crazy right now haha. The cost of attending a college or university today is just plain ridiculous. Like you said, it’s not like that money is going back into making the school better – much of it is going to higher administration costs and salaries. It’s just ridiculous. Sure, there are degrees that provide a good return on investment despite the higher costs but they are getting fewer and fewer. Eventually people are going to realize that it’s just no longer worth it, if this trend continues. That’s a good thing for e-Learning though, and instructors who are active on these platforms. By the way, did I ever get you that free coupon for my 1st course? If you emailed me I may not have gotten it – I think my email client has been having some problems. Let me know! James McAllister recently posted…New Course: Achieve Financial Independence And Retire Early!